2213 wines have been put in the 200 dinners which makes 11,1 wines per dinner. 136 different vintages have been represented and the average age of the wines when they have been drunk is 48,5 years. (the age is the difference between the millesime of the wine and the year when it was drunk). The liquorous are the most aged wines of the dinners, with an average of 67,4 years. I am happy that Domaine de la Romanée Conti is the most represented in my dinners, with Yquem as nearly equivalent. What is interesting is that for every wine, I presented old wines, taking the risk to choose old wines. Lafite and Filhot have an average age exceeding 70 years and even for wines like Moët & Chandon, the average age is of 54,9 years. This means that I wanted that the participants of my dinners enter deeply in the world of old wines. Considering the average age of the wines of each dinner, the dinner with the highest average age will be the 200th with an age of 98,5 years with 4 wines of the 19th century. The second one is the 160th dinner with an age of 95,1 years with 5 wines of 1900 and 3 wines of the 19th century. Normally in every dinner, people vote for their preferred wines. I have voted in all the dinners. And people voted for 159 dinners, as sometimes it was difficult to organize votes. The wines in my votes named 1st have an age of 68,7 years and the ones which had no vote from are 43,3 years old. It could mean two things. Either I have a special love for old wines, or I chose preferably the greatest wines among the oldest wines. It could be a combination of the two reasons. For the 159 dinners with votes of everyone, the wine which was voted 1st by the consensus was for 76 dinners also my number one, in 31 dinners my second one, in 29 my third one, 6 times my number four and 17 times with no vote from me. 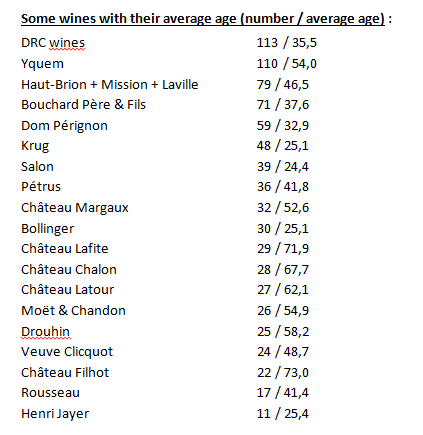 I am always surprised by the diversity of the votes, which shows that the approach towards old wines is very personal. Cette entrée a été publiée dans dîners de wine-dinners le 10 avril 2016 par François Audouze.